Are you a sewer or crafter? 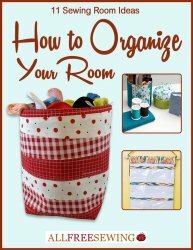 Check out this free ebook on Amazon: 11 Sewing Room Ideas. Organize your stash, spruce the place up and make it a truly inviting workspace! Keep in mind, this book was free at the time of this posting (August 5th, 2014). The deal may expire by the time you read this. Make sure you check the price before checking out with what you believe is a free book. You can read these ebooks on any smartphone, computer, tablet or Kindle using the free Kindle app.